If you are looking for a professional painter, in the Newport News and Yorktown area, Hire Major League Painting. We are here to help you through the entire painting process, from planning, picking colors, estimates, and finally a high-quality paint job. Time: A professional painter saves time. Any business or homeowner who has ever started a simple do-it-yourself painting project understands the challenges of getting the job done on time. There are always extra trips to the paint store for supplies. It is difficult to accurately estimate the time required to properly prepare the project area. And, there is always the unanticipated time required for touch-ups and repair. Hire a professional painting contractor, then schedule more important – and more fun – things to do with your valuable time. Money: A professional painter saves money. Many do-it-yourself project ends up costing more than the original budget. Whether it's underestimating total paint needs, adding in the cost of clean-up, or all the other unanticipated expenses that come up, don't put the additional strain on your wallet. Hire an experienced painter for your home or business that knows the right product and has the right tools to complete the job on time. 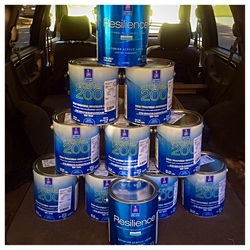 Safety: A professional paint contractor knows safety. Every painting project requires attention to safety. There are common hazards on every paint project site that could cause injury and job-time losses, and may even affect your income. Most insurance requires a deductible, so any accident will increase the cost of the project. Hire a professional painter who is trained on the most up-to-date safety rules to limit the possibility of accidents and reduce your exposure. Why put your personal safety at risk? Quality: A professional painting contractor delivers quality. The choices today are more complicated than just oil or latex. Most do-it-yourselfers don't have the industry knowledge to know what works, how to use it, or have the right tools for the job. Details such as surface prep, paint application and a material's long-term durability often get overlooked. The use of high quality products is as important as excellence in paint application. Hire a local professional painter who is educated on all of the different aspects of any painting project helps eliminate surprises and ensures you have a finished product you can be proud of. Major League Painting uses, Sherwin-Williams, Valspar, Glidden, Olympic, Behr, Kilz, and Zinnser Paints. It all depends on the application and the customer's preferences.